Dr. Yogesh Patil currently is a Professor and Head – Research & Publications at the Symbiosis Centre for Research and Innovation (SCRI), Symbiosis International University (SIU), Pune, India. Dr Patil did his doctorate research work at the Division of Microbial Sciences, MACS Agharkar Research Institute (DST Funded), Pune, India and obtained his PhD from University of Pune, Pune. He has qualified GATE as well as UGC-NET. After completing his PhD, for a short stint he was at Abeda Inamdar Senior Science College for Girls, Pune, after which he joined in the PG Dept. of Environmental Management, Chh. Shahu Institute of Business Education and Research, Kolhapur. Here he taught wide range of subjects related to Environmental Science, Management and Technology and undertook many research projects. In 2010, Dr. Patil joined at Symbiosis Institute of International Business (SIIB) as an Associate Professor for the MBA (Energy & Environment) programme. Dr. Patil has over seventeen years of post-graduate teaching and research experience in the broad areas of Environmental Science, Management & Technology. His scholarly interest and area of expertise include - waste resource management, bioremediation using active and passive biomass, sustainability, climate change mitigation and industrial ecology. More specifically, his research focus spans in the area of biodetoxification of metal-cyanide complexes and thiocyanates, bioreduction, biosorption of toxic and precious metal complexes using active and passive microorganisms/biomass, resource recovery from waste, water and wastewater quality, solid waste, e-waste management and sustainable waste management strategies/models. He has published over fifty research papers and chapters in national and international journals indexed in Scopus, SCI, etc. and books with reputed publishers like Springer, Peter Lang, etc., and has also published two edited books namely, Applied Bioremediation – Active and Passive Approaches (InTech, Croatia) and Reconsidering the Impact of Climate Change on Global Water Supply, Use, and Management (IGI Global, USA). As a guest editor, Dr. Patil has also published three special issues of Elsevier journal and has also filed three patents. Dr. Patil has undertaken several research/consultancy projects funded by UGC, International Foundation for Science (IFS), Sweden & Organization for the Prohibition of Chemical Weapons (OPCW – Nobel Peace Prize in 2013), The Netherlands, World Bank and PMC. He is recipient of several honors/fellowship awards like DST-JRF, CSIR-SRF, Best PhD Research Award, UGC-Post Doctoral Fellowship to name a few. 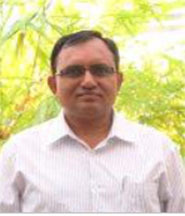 He is a reviewer for several journals indexed in Scopus and SCI. Dr. Patil has a passion for teaching and research and likes to work in interdisciplinary area, which cuts across science, technology and management. Patil YB and Paknikar KM (2000) Development of a process for biodetoxification of metal cyanides from wastewaters. Process Biochemistry 35: 1139-1151. Patil YB and Paknikar KM (1999) Removal and recovery of metal cyanides from industrial effluents. Process Metallurgy 9: 707-716. Patil YB and Paknikar KM (1999) Removal and recovery of metal cyanides using a combination of biosorption and biodegradation processes. Biotechnology Letters 21: 913-919. Patil YB and Paknikar KM (2001) Biological detoxification of nickel-cyanide from industrial effluents. Process Metallurgy 11: 391-400. Prashanth MS and Patil Yogesh B (2006) Behavioural surveillance of Indian major carp Catla catla (Hamilton) exposed to free cyanide. Journal of Current Sciences 9(1):313-318. Patil Yogesh B (2006) Isolation of thiocyanate degrading chemoheterotrophic bacterial consortium. Nature Environment and Pollution Technology 5(1): 135-138. Gaddi Shivanand S and Patil Yogesh B (2011) Screening of some low-cost waste biomaterials for the sorption of silver-cyanide [Ag(CN)2-] from aqueous solutions. International Journal of Chemical Sciences 9(3): 1063-1072. Hunashal Rajiv B and Patil Yogesh (2011) Environmental noise pollution of Kolhapur city. Nature Environment and Pollution Technology 10: 39-44. Patil Yogesh B (2011) Utilization of thiocyanate (SCN-) by a metabolically active bacterial consortium as the sole source of nitrogen. International Journal of Chemical, Environmental & Pharmaceutical Research, 2: 44-48. Hunashal Rajiv B and Patil Yogesh B (2012) Assessment of noise pollution indices in the city of Kolhapur, India. Procedia - Social and Behavioral Sciences 37: 448-457. Itankar Nilisha P and Patil Yogesh B. (2014) Management of hexavalent chromium from industrial waste using low-cost waste biomass. Procedia – Social and Behavioral Sciences 133: 219-224. Kulkarni Shilpa, Rao Prakash and Patil Yogesh (2014) Are the non-renewable resource utilization and waste management practices employed in Indian automobile sector sustainable? Procedia – Social and Behavioral Sciences 133: 361-371. Patil Yogesh B (2012) Development of an innovative low-cost industrial waste treatment technology for resource conservation - A case study with gold-cyanide emanated from SMEs. Procedia- Social and Behavioral Sciences 37: 379-388. Bhat Viraja, Rao Prakash and Patil Yogesh (2012) Development of an integrated model to recover precious metals from electronic scrap - A novel strategy for e-waste management. Procedia - Social and Behavioral Sciences 37: 397-406. Saini Samir, Rao Prakash and Patil Yogesh (2012) City based analysis of MSW to energy generation in India, calculation of state-wise potential and tariff comparison with EU. Procedia - Social and Behavioral Sciences 37: 407-416. Itankar Nilisha P. and Patil Yogesh B. (2014) Biosorption of toxic hexavalent chromium from aqueous solutions by low-cost biomaterial. International Journal of Chemical Sciences. 12(2): 479-488. Patil Yogesh, Bhat Viraja and Rao Prakash (2014) Management of electronic waste by employing combined technological strategies. Global Journal of Finance and Management 6(6): 545-550. Bhat Viraja and Patil Yogesh (2014) E-waste consciousness and disposal practices among residents of Pune city. Procedia – Social and Behavioral Sciences 133: 491-498. Kumari Sneha and Patil Yogesh (2016) Trends of seeds in the era of climate change – an issue of concern towards sustainability. Indian Journal of Science and Technology 9(21). Bhat Viraja, Rao Prakash and Patil Yogesh (2016) A perspective about e-waste and the regulations with special reference to SME’s. International Journal of Innovative Research and Development 5(2): 390-395. Patil Yogesh, Gaddi Shivanand and Hunashal Rajiv (10/2015) Potentials of Some Waste Biomaterials as Sorbents for Gold- and Silver-Cyanide Removal from Aqueous Matrices Advanced Materials Research 1130: 627-630. Patil Yogesh and Rao Prakash (10/2015) A Novel Biological Strategy for the Management Industrial Effluents with Simultaneous Recovery of Metal Resource. Advanced Materials Research 1130: 640-643. Itankar Nilisha and Patil Yogesh (10/2015) Biosorptive Removal of Hexavalent Chromium from Aqueous Industrial Solutions by A Novel Wood Apple Shell Powder Biomass. Advanced Materials Research 1130: 689-692. Patil Yogesh, Bhat Viraja and Rao Prakash (10/2015) An Innovative Model of Managing Silver Metal from Electronic Scrap Using a Combination of Chemical Leaching Followed by Biosorption and Biodegradation. Advanced Materials Research 1130: 697-700. Patil Yogesh B and Kulkarni Anil R (2008) Environmental sensitivity and management of toxic chemical waste in mining industry with special reference to cyanide. In: High Performing Organizations: Needs and Challenges, Tata McGraw Hill Publications, Part D: pp. 183-196. Rao Prakash, Patil Yogesh and Gupte Rajani (2013) Education for Sustainable Development: Trends in Indian Business Schools and Universities in a Post Liberalization Era. In: Sustainability Assessment Tools in Higher Education Institutions - Mapping Trends and Good Practices Around the World (Editors: Sandra Caeiro, Walter Leal Filho, Charbel Jabbour, Ulisses M. Azeiteiro), Springer International Publishing, Switzerland, Part IV, pp. 417-432. Patil Yogesh B (2013) Development of a bioremediation technology for the removal of thiocyanate from aqueous industrial wastes using metabolically active microorganisms. In: Applied Bioremediation - Active and Passive Approaches (Edited by Yogesh B Patil and Prakash Rao), Intech Open Science Publishers, Croatia, pp. 33-52. Itankar Nilisha, Bhat Viraja, Chourey Jayati, Barve Ketaki, Kulkarni Shilpa, Rao Prakash and Patil Yogesh (2013) Resource recovery from wastes containing valuable metal species using low-cost biomaterials – An approach of passive bioremediation and its newer applications. In: Applied Bioremediation - Active and Passive Approaches (Edited by Yogesh B Patil and Prakash Rao), Intech Open Science Publishers, Croatia, pp. 255-283. Rao Prakash, Patil Yogesh, Ketkar Manisha, Bhat Viraja, Kulkarni Shilpa (2014) Sustainability in an educational institution: analysing the transition to paperless e-processes, an Indian case. In: E-Learning and Education for Sustainability, Environmental Education, Communication and Sustainability Series, Ulisses Miranda Azeiteiro, Walter Leal Filho, Sandra Caeiro (eds. ), Peter Lang GmbH International Academic Publishers, Germany, Volume 35, pp. 215-233. Patil Yogesh and Rao Prakash (2014) Industrial waste management in the era of climate change - A smart sustainable model based on utilization of active and passive biomass. In: Handbook on Climate Change Adaptation (Editor: Walter Leal Filho), Springer-Verlag Berlin Heidelberg, Germany pp. 2079-2092. Rao Prakash and Patil Yogesh (2014) Climate resilience in natural ecosystems in India - Technology adoption and the use of local knowledge processes and systems. In: Handbook on Climate Change Adaptation (Editor: Walter Leal Filho), (Editor: Walter Leal Filho), Springer- Verlag Berlin Heidelberg, Germany pp. 2063-2078. Rao Prakash and Patil Yogesh (2015) Integrating energy and environment in postgraduate management education: a case study from Symbiosis Institute for International Business, Pune, India. In: Implementing Campus Greening Initiatives, World Sustainability Series, Walter Leal Filho et al. (Eds), Springer International Publishing, Switzerland, pp. 265-276. Rao Prakash, Patil Yogesh, Bhat Viraja and Kulkarni Shilpa (2015) Environment and Social Sustainability Approaches in Policy and Practice: A Case Study of Symbiosis International University, Pune, India. In: Transformative Approaches to Sustainable Development at Universities, Working Across Disciplines (Editor: Walter Leal Filho), Springer International Publishing, Switzerland, pp. 471-488. Kumari Sneha and Patil Yogesh (2016) Achieving climate smart agriculture with a sustainable use of water: a conceptual framework for sustaining the use of water for agriculture in the era of climate change. In: Reconsidering the Impact of Climate Change on Global Water Supply, Use, and Management. IGI Global, USA, pp. 122-143. Kumari Sneha, Patil Yogesh and Rao Prakash (2016) An approach to sustainable water shed management: case studies on enhancing sustainability with challenges of water in Western Maharashtra. In: Reconsidering the Impact of Climate Change on Global Water Supply, Use, and Management. IGI Global Publishers, USA, pp. 252-271. Patil Yogesh and Itankar Nilisha (2017) Method of removal and recovery of hexavalent chromium from effluents by passive-active biological process. Indian Patent Application No. TEMP/E-1/7788/2017-MUM (Applicant: Symbiosis International University, Pune). Patil Yogesh (2017) Process for removal and recovery of copper-cyanide complex using microalgae. Indian Patent Application No. TEMP/E-1/7779/2017-MUM (Applicant: Symbiosis International University, Pune). Paknikar KM and Patil YB (1998) Microbial degradation of cyanide and metal-cyanide complexes from wastes. Indian Patent Appication No. 123/BOM/98 (Applicant: Agharkar Research Institute).